Headlines: The fishing has been improving dramatically in the lakes with some great reports from both fly and bait anglers. Trolling has also improved. The rivers are set to open very soon also have good water and plenty of nice fish to be caught in a couple of weeks. We are steadily stocking up for the opening of the trout season with lots of terminal tackle, lures, bait, flies and fly accessories, waders, powerbait, and the like. New items like Celtas in Rainbow and Brown Trout colours are now also in stock. Lake Eucumbene continues to rise and is now at 27% plus! This the highest it has been for three years and the lake has already started to fish well for bank anglers and should get better and better with time. As you can see the lake is already starting to cover new ground. We are predicting that the fishing will be an absolute bonanza as the water warms over the next few weeks. Watch this space. The Yamaha and Freshwater Fishing Australia, Snowy Mountains Trout Festival is on again this year. Rivers:- Reopen Saturday the 3rd of October. There has been some great rain over recent weeks and some good snow melt to come so the streams of the mountains will be a great place to be for the opening weekend. Glo bugs and beadhead nymphs will be the optimum patterns for the Euc and Thredbo rivers. We have a good stock of beadhead copper johns in now too and these are little killers on the rainbows. The way it is warming up termite falls might be a bit earlier this year so a few of those could be handy as well. Lake Eucumbene:- Fly reports have picked up with some nice fish being taken off the bank in several areas. Evenings and first light on a morning have been the best though you can polaroid the dam wall area for good results at this time of year. Wind has played havoc with anglers on several days over the past week but the fishing has still be good for those who have kept fishing. Already there are reports of midges moving in the mornings and this should be the start of a great midge year. Fish have been found to have lots of pin head sized black beetles as well as numerous small grubs in them. These have been drowned with the rapidly rising water. It is a great time to be on the lake at present. The lake has plenty of non muddy bank access at and with the continuing rise of the lake will be this way for most of the season. *Brian Mayston from Anglers Reach has landed a superb brown this week. Weighing in at 3.2 kg this 62 cm fish is in great condition. The first of many good fish that will come out of the lake this season. *Anglers competing in the Fly Fish Australia Nationals over the weekend caught 348 fish between the 20 anglers fishing in Tantangara and Eucumbene. Best fish was around the 3.7kg mark out of Eucumbene. The vast majority of theses fish were caught in Tantangara. All of these fish were released. *Eddie and Monir travelled up from Canberra for the weekend and had a good couple of days on the lake. Though not all big fish they still managed to catch a dozen between them. Another good sign of things to come. Other anglers have reported some good boat based fly fishing as well. The lake is really starting to fish well drifting and loch style fishing. Try a Scruffy, Hamils, Simpson, Bugger, Fuzzy Wuzzy in likely looking spots with a bit of a drop off or soak and you should be able to hook up on a couple. Midge pupa and other small size 14 and 16 wets and nymphs should do well in the shallow margins early and late also. Lake Jindabyne:- Jindabyne has picked up a little with a couple of quality fish caught by polaroiders recently. The lake has risen a fair amount but the fish don't seem to be worried by it at this stage. Searching with a woolly bugger will produce a few nice ones or just wander the bank looking for fish and cast a small wet or nymph at any fish found cruising. There is still a heap of weed in many of the bays that is drawing the fish in to the food that it holds. Try Bushy's horror, gold ribbed hares ear, stick caddis and midge pupa. Try the Eastern side during the morning and Western side in the early afternoon. Lake Tantangara :- No reports. Eucumbene:- Eucumbene reports have been varied with wind playing havoc on the weekends. Deep trolling and drifting and casting lures around the river mouth would be one the best methods at the moment. Be aware that with the rising water there have been some logs and other debris starting to float and drift around the dam. Keep an eye open for these while travelling around the lake. Vibe stlye lures are starting to come into their own either flat lined or on leadcore, They are very versatile little lures and should rack up some nice fish for you on the lake this season. *James and Bluey from Canberra managed to catch a few nice fish in the Old Adaminaby and Anglers Reach area on the weekend. Using leadcore they caught six nice fish. Tassie Devil in colour 23 was the better lure. *Sixteen Members of the Canberra Fisherman's Club attended the ever popular Kalkite Outing this year capturing a total of twenty three rainbows and seventeen browns. The club is an ANSA based club and as such 1kg and 2kg line are the norm for these fishos. Some of the browns caught were of great quality with Phil Lawrence catching the heaviest at 2.49kg and Bruce Murray landing a ripper 2.35kg fish. Bruce also landed one other brown and two rainbows. Dave Walton landed a great 2.30kg on 2kg line, and Chris De La Rue picked one up the day before the Outing at 2.05kg on 1kg line. There were another nine browns over the 1kg mark landed. Jamie Stanfield caught the heaviest rainbow which was 1.18kg on 1kg line taken on rainbow powerbait. David Stacy also did well with a brown of 1.42kg on 1kg line and a rainbow of 0.76kg on 1kg line. Anthony Heiser recovered from dropping several fish under the boat to land a brown of 1.77kg on 1kg line on the troll, and another Brown of 1.00kg on 1kg line from the bank. Anthony also had a big brown follow up to the boat while he was changing his lure on the troll. Our first order of mudeyes has hit the store this week and these along with scrubbies, gulp, powerbait and grubs should catch a few over the next few weeks. Baitfishing in Eucumbene has been excellent with the dam wall being a very good spot to try. Some middle of the day sessions have been good in this area with Powerbait being the most consistent. Ken and I went to Buckenderra on the 19th . We caught two rainbow trout the first one at about 3.45 pm a 45 cm 1 kg fish. The second one at about 6.15 pm and a bit less than a 1 kg. We caught the fish on Lemon twist powerbait. *Bob Marek and Chris fished out of Buckenderra on the weekend for eight nice rainbows to 1.5kg. Rainbow Powerbait, Scrubworms and Grubs were the baits used. Wood grubs and scrub worms have been very good and make great combo baits fished in conjunction with Powerbait on a dropper rig. Cocktailing grubs and Powerbait on the one hook is also a dynamite way to catch the fantastic rainbows that are cruising around the edges during the day. 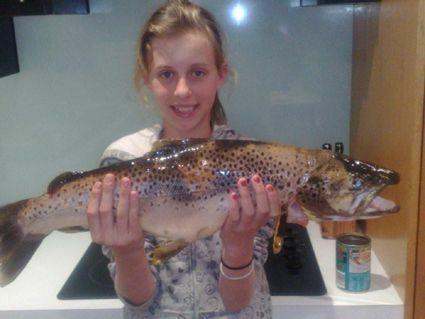 *Bryson,Georgie, Annabelle and Kirstie Green fished Kalkite ,friday night and Kirstie, pictured below, caught this brown on power bait. A great fish! Try Hatchery Bay, Curiosity rocks, Claypits, Stinky Bay, and Kalkite in Jindabyne.